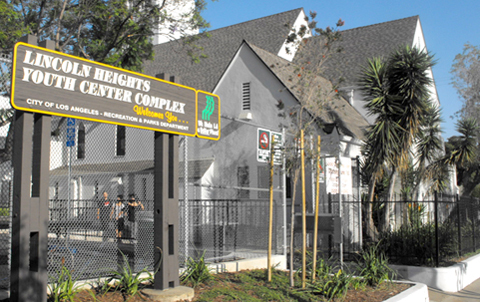 An old Lincoln Heights chapel is converted into a modern facility to deliver fitness and art programs to young residents. A former place of worship is now a training ground for perhaps the next great boxing champion, now that city officials have unveiled the latest youth center in Lincoln Heights. At a press conference on Monday afternoon, city officials took turns hailing the Lincoln Heights Youth Center Complex as an innovative approach to improving the quality of life in the northeast Los Angeles neighborhood by converting an old church into a youth center that will host a variety of athletic and arts programs. Saul Romo, assistant general manager of the Department of Cultural Affairs, said the center will also feature a computer lab along with arts and music programs. Both the Department of Cultural Affairs, and the Department of Parks and Recreation will administer programs at the center. City Engineer Gary Lee Moore said it took three years and $7.2 million to restore the historic church first constructed in 1930. The renovation of the original chapel and a newer addition included a complete seismic retrofit, installation of an elevator and improvements to make the center accessible to the handicapped. The end result is a 15,000-square-foot center that offers a unique, albeit cramped, setting for youth and adults. For Los Angeles City Councilman Ed Reyes (CD-1), the center’s location compensates for its lack of space. The center, located on the corner of Altura Street and Griffith Avenue, is surrounded by single-family homes and apartment buildings on all sides. Reyes said the city must place services where gang members live to provide alternatives to the youth in those troubled spots. The center features a youth and women’s kick boxing class, male and female weight rooms and a youth boxing program. With the celebratory mood created by city officials on full display, the new center also highlights the closure of the former Los Angeles Youth Athletic Club that operated similar fitness programs out of the fifth floor of the old Lincoln Heights jail on Lacey Street for over four decades. The city formally closed the doors of LAYAC on April 30 citing safety issues found during a safety inspection conducted by the Los Angeles Fire Department. As she led a group of women and children through warm-ups for a kickboxing class, Fortaleza Loaisiga sported a black LAYAC t-shirt. Loaisiga said she enjoyed the spacious environment at the old gym but offered some praise for the new center. In the center’s rear, a group of young boys began warm up drills inside a boxing gym that featured a brand new ring and training equipment. For volunteer trainer Gabriel Navarro, the center offers a chance to bring his beloved sport to a new set of youth. Navarro, 73 said he used to train up to 50 kids a week at the LAYAC where he volunteered for 11 years. As he looked around, he said he currently has a group of five to six young fighters. So far, Navarro said he has seen one boy make the transition from LAYAC to the new center. Tony Martinez is one of the new fighters to take on the training offered by Navarro. Martinez, 16, is a student at Stern MASS, a charter high school on the campus of Cal State Los Angeles. Martinez said he lives two blocks from the center and hopes to use boxing to enhance his physical fitness. Ed Barraza, a former LAYAC volunteer, said he is happy the center is open but remains concerned that its limited space is not enough to serve the 200 or so youths who utilized the LAYAC. Barraza, a teacher at Burbank Middle School, said attempts to sit down with Reyes to discuss options for a future home for LAYAC have not materialized. At the center’s opening, Reyes acknowledged the limited space but pressed that it is the best situation for the youth. Reyes said his hands are tied due to the city’s current financial condition. “With this center, we have to establish a new reality,” Reyes said. “If we want to provide options for young people, then we need to be creative. If a kickboxing class conducted in a former church chapel, complete with stained class windows, does not count as creative, then perhaps a full-sized outdoor hockey rink in northeast Los Angeles does. In a city where basketball courts are the norm, what separates this center is the street hockey rink, complete with court markings and lights for night games. For Benecio Avendano, 26, the hockey rink offers a unique opportunity to teach local youth the sport he learned on the old tennis courts at Lincoln High School. As a small group of young boys took turns swiping at orange balls and black pucks, some in skates, others in tennis shoes, Avendano said the court offers a new experience. For now, Avendano said he volunteers Monday through Wednesday from 4:30 p.m. to 6 p.m. The center’s hours in July are limited to 2 p.m. to 6 p.m. during the week. Celina Moreno, the LHYC coordinator, said she hopes to expand the center’s hours in August. Until that time, Avendano said he has enough hockey gear for 30 players. As for a hockey rink in his neighborhood, Avendano offered a familiar response on the city’s response to a resident’s request. It only took 14 years?? That is city government for you. Sounds like the concerns of the community were never listened too. They really tricked everyone from the old gym on 19 St. to show up for the grand opening on Altura St. After several request on how much the cost would be no one at the faciltiy would answer. Not until 2 months after the grand opening the bomb was dropped. The cost on 19th St. was $10 a month, and it covered the ladies weight room, aerobic, kickboxing, everything. The cost on Altura St, is $20 to $25 per individaul class. That means the price went up 1 1/2 times off the top. There was about 25 or more people per class before the cost was given to everyone. Now there is about 6 to 8 per class. We live in Lincoln Heights not Bevery Hills.